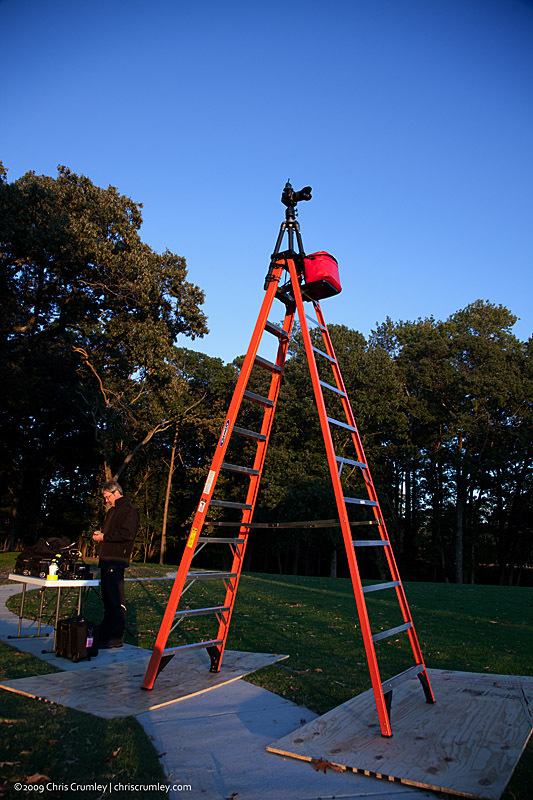 The decision tree for an elevated picture angle might start with a helicopter, but a multi-frame dusk/dark composite image prevented that (budget, too). A bucket lift would be too wiggly. Scaffolding would have been fine, but would've needed a lot of delivery and erection effort. That pretty much left an A-Frame ladder. We wanted 16' but there were none in the local rental system, so we settled for my 12' fiberglas and a tripod extension secured hard to the ladder. Assistant Dale Maurice works on the radios for remote strobe communications.